NAHID RACHLIN attended the Columbia University MFA program on a Doubleday-Columbia Fellowship and the Stanford University MFA program on a Stegner Fellowship. Her publications include a memoir, Persian Girls (Penguin), four novels, Jumping Over Fire (City Lights), Foreigner (W.W. Norton), Married to a Stranger (E.P. Dutton-City Lights), and The Heart’s Desire (City Lights), and a collection of short stories, Veils (City Lights). Her short stories have appeared in more than fifty magazines, including The Virginia Quarterly Review, Prairie Schooner, Redbook, and Shenandoah. One of her stories was adopted by Symphony Space, “Selected Shorts,” and was aired on NPR. 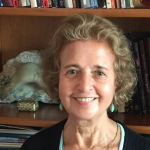 Her work has received favorable reviews in major magazines and newspapers and has been translated into Portuguese, Polish, Dutch, Arabic, and Persian. She has written reviews and essays for the New York Times, Washington Post, Los Angeles Times, and Newsday. Other awards and grants she has received include the Bennet Cerf Award, the PEN Syndicated Fiction Project Award, and a National Endowment for the Arts grant. She has been interviewed in magazines such as Poets & Writers and The Writer’s Chronicle. http://www.nahidrachlin.com.